When Tibet makes the headlines it is usually for one of three issues: Chinese Government crackdowns on unrest inside Tibet, such as the current situation in Ngaba; ‘Free Tibet’ protests in the West; or the Dalai Lama’s meetings with world leaders. However, a different story has engaged the international media and community in recent weeks: that of the election of a new Kalon Tripa, or Prime Minister, of the Tibetan Government-in-Exile. Receiving 55% of the 49,184 ballots cast by exile Tibetans living in over 30 countries, Dr Lobsang Sangay, a Harvard law scholar, was elected as Kalon Tripa on 27th April 2011. The result was announced by the exile government’s Election Commission at their base in Dharamsala, India. Whilst there have been two previous direct elections of exile Kalon Tripas and democratic parliamentary elections have been organised by the exile government since 1960, this year’s elections are different, and arguably more important, for one key reason. On 14th March 2011, the Dalai Lama announced to the Tibetan Parliament-in-Exile that, at the age of 75, he was retiring from political life and would devolve his political authority to elected leaders. Though the Dalai Lama has, over the past decades, been progressively distancing himself from a direct political role, this declaration marked a significant transition in Tibetan politics. For, in standing down as both head of state and head of government – though retaining his role as spiritual leader – the Dalai Lama is relinquishing a four-century old tradition of power. Given such a fundamental changes to the role of the reincarnation of Chenrezig, and fearing that the community would fragment and the broader cause lose direction, the exile community has been reluctant to support the Dalai Lama’s resignation. However, His Holiness appears resolute, and on 25th May turned down an official appeal by exile Tibetans to remain as the "ceremonial head of state". Despite this decision raising important constitutional issues for the exile government which are currently being discussed in Dharamsala, the transferral of political authority to an elected leadership is seen by the Dalai Lama as being in the best interests of the Tibetan people in the long run. Not only does it circumvent China’s claim to appoint the next Dalai Lama by positioning Tibetan temporal authority outside of China and beyond its authorities’ control, but this pragmatic political decision encourages the elected exile leadership to assume greater responsibility for the future of Tibet. In thus empowering the nascent Tibetan democracy, the Dalai Lama’s decision to stand down from political life also means that at the new Kalon Tripa is expected to take on much of the political authority and functions previously borne by His Holiness. As such, with more political clout, Lobsang Sangay will play a significantly more prominent role in the Tibetan movement than his predecessors. 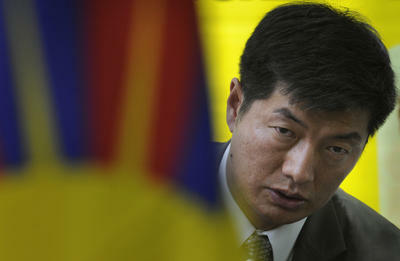 So who is Lobsang Sangay? Born in 1968 to parents who escaped from Tibet in 1959, the same year as the Dalai Lama, he grew up in a Tibetan refugee settlement near Darjeeling. He completed a B.A. and LLB from St Joseph's College and Delhi University respectively and, in 1992 was elected as an executive member of the Tibetan Youth Congress (TYC), the largest Tibetan NGO in exile. With a Tibetan Fulbright Fellowship he moved to Harvard Law School in 1995 where he received his LLM and, in 2004, was the first Tibetan to earn a doctorate degree from that institution. Whilst at Harvard, Sangay held the position of Research Fellow at the East Asian Legal Studies Program and organised a series of conferences bringing together Chinese, Tibetan and Western legal scholars, including unprecedented exchanges between the Dalai Lama and Chinese scholars in 2003 and 2009. With such a background, Sangay represents a significant shift in exile leadership. He brings with him a new style of Tibetan politics: one that is young, Western educated and secular, and which has the potential to inject new energy into the Tibet movement. More generally, the recent elections have heralded a new era of Tibetan politics. Tibetan democracy has, since its inception 41 years ago, been dominated by cultural values which promote humility and regard self-promotion negatively, resulting in candidates who are often reluctant to put themselves forward and a general lack of voter engagement. In contrast, with the Dalai Lama’s impending retirement alongside dynamic candidates and an increasingly web-savvy diaspora, the 2011 elections saw lively political debates in cities across the world, hustings broadcast live over the internet and active campaigns for individual candidates. With unprecedented public engagement with and participation in these elections, especially among younger Tibetans, exile democracy is perhaps finally coming of age. But what of the bigger question of the future of Tibet itself? In initial statements post-election, Sangay has declared intentions to retain the Dalai Lama’s ‘Middle Way’ stance on the future of Tibet and relations with China: that is, seeking genuine autonomy for the Tibetan people within China through peaceful negotiations. With this approach premised on promoting a culture of trust between the nations of Tibet and China, questions arise as to how Sangay, who has never set foot in Tibet, will foster such a culture and productive dialogue with Beijing? He has stated that he is ‘willing to negotiate with the Chinese government anytime, anywhere’, but faces significant challenges. With nine rounds of talks between the Dalai Lama’s envoys and the Chinese Communist Party's United Front Work Department having yielded no progress, the Middle Way approach is arguably at an impasse. Moreover, alongside ongoing statements that the exile Tibetan government is an illegal separatist clique with no recognition, the Chinese Government’s reaction to Sangay as an individual have been swift and damning. On 22nd March 2011 the Chinese People’s Daily denounced him as a ‘terrorist’ due to his previous position with the pro-independence TYC, an organisation which Beijing likens to ‘Al-Qaida, Chechnyan armed terrorists and "East Turkistan" separatists’ and which it blames for the uprising in Lhasa in spring 2008: allegations which are categorically denied by TYC. As such, Beijing is refusing to deal with Sangay, or his government, directly and the extent to which the Dalai Lama will remain involved in the ‘dialogue process’, even by name-association alone through his envoys, remains undecided. Perhaps other strategies will emerge. With the Dalai Lama standing down from Tibetan politics, space may open for debate within the diaspora over alternative policies for the future of the homeland, and Sangay is keen to stress his track record of closed-door discussions with Chinese scholars at Harvard. So great uncertainties lie ahead and Sangay faces daunting challenges in his new role. As the elected leader of a government which no state recognises he has the unenviable tasks of keeping the exile community together and the issue of Tibet alive in a post-Dalai Lama future; running an exile bureaucracy despite no experience of government; and dealing with a Chinese administration which shows little willingness to compromise. But he also comes to office with energy and enthusiasm for seeking justice for Tibet, the support of an exile civil service with 50 years of experience and huge expectations and hope from Tibetans inside and outside Tibet. International media are likely to keep a close eye on his progress. Dr Fiona McConnell is a political geographer and Junior Research Fellow at Trinity College, University of Cambridge. Her research focuses on the everyday construction of statehood and sovereignty in cases of tenuous territoriality.